Lynda Martens is the Wabisabi Therapist and a contributor to the Mediate to Go Blog. Please read her insights about trust, and how to rebuild trust. 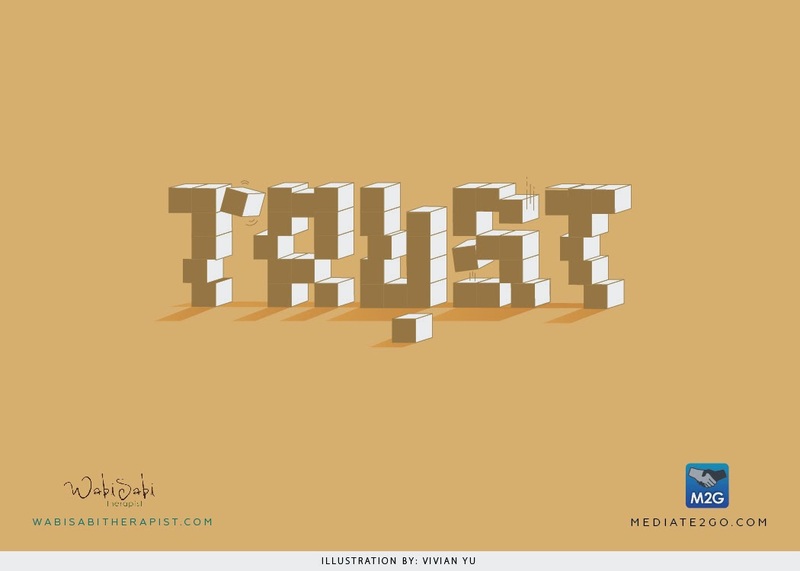 Also, please see our other blog on the Definition of Trust. Trust is one of the fundamental elements in a relationship. We cannot really be close to someone if we can’t trust them. And if you are close to someone you know you cannot trust…ask yourself why. This blog is for those of you who have messed up…made a mistake…hurt somebody…damaged the trust someone had in you. It is within your power to earn that trust back. Note that I said earn. You cannot demand trust. It must be earned, and given freely. There is no big sign that declares someone trustworthy or not. Someone decides…or not…to place their trust in you. To trust that their heart/money/safety is safe with you. Trust is a gift, and a decision. Be patient: Know that it cannot be fixed immediately. Try not to rush the process. You may feel better if the incident is never mentioned again, but that’s not realistic. See the rebuilding as a process that is worthy of time and patience. Take responsibility for what you did: You are not responsible for their emotions…only for what you did. Name what you did. Name that it wasn’t okay. Name the effect you think it had on them. Be Transparent: If the mistake was a lie about something that was hidden, then the gift of transparency is powerful. Information is power. Letting your loved one know where you are, who you are with…leaving your email, phone and facebook account open and available…openness feeds trust. Do not repeat the behaviour: If a mistake is made and the lesson is learned, that is one thing, but if you are repeating the behaviour, then you may want to seek professional help if figuring out why this is happening. Acting trustworthy is ultimately the only way to get people to trust you.